The ‘Tresham Project’, as I have occasionally rather grandly referred to it, finally yielded some results on 30 October. I first proposed in September 2012 the idea that Sir Thomas Tresham’s wallpaintings, described in detail in British Library Add MS 39831, might still survive in some form under the layers of paint and plaster on the window at the west end of the Long Gallery of the Bishop’s Palace in Ely. Tresham was imprisoned in the Palace in 1588, 1593 and 1597 and commissioned the paintings during his last incarceration. The beauty of this MS source is that it pinpoints beyond doubt the exact location of the paintings – usually, paintings are found by accident because no-one ever recorded where they were. Finally, at the end of October this year, Paul d’Armada from Hirst Conservation began the investigation, making 15 holes in the plaster around the window. Most of them revealed that this area of the building had been considerably altered in the nineteenth century when most of the stone window frame had apparently been replaced. Finding any trace of anything older than the eighteenth century was looking dicey. However, at about 3pm on the afternoon of 30 October, Paul uncovered a section of the north reveal of the west window where it was possible to identify a series of ancient limewashes going right back, apparently, to the original layer done when the building was constructed in 1549. Not far above this was a layer on which some thick dark streaks or lines appeared, slightly raised in texture. My initial thought was that these might be traces of Tresham’s paintings – but even the most charitable appraisal of the lines makes this a difficult case to advance. On the other hand, they don’t look like accidental deposits. My eventual conclusion, after much consultation with Tresham scholars, is that these streaks are evidence for Tresham’s paintings, but not remains of those paintings. 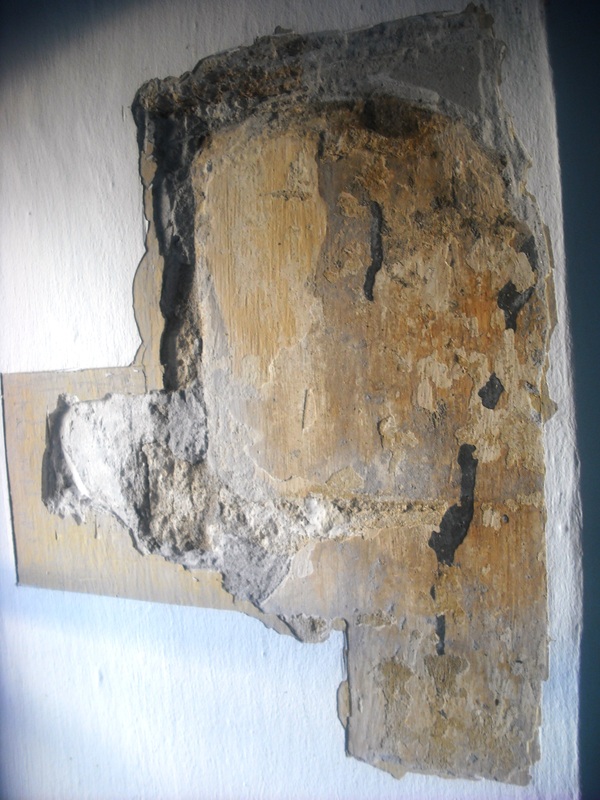 I believe that Tresham painted on cloth, which was then stuck to the wall using bitumen – and the streaks are the surviving bitumen adhesive. I hope to advance the full argument for this case in an article next year. The discovery was recently reported in the Ely Weekly News. This entry was posted on November 26, 2013 by jacobite.